My friend is using Microsoft Word for Mac (which is a total train smash). and we want to change the spell check from English (US) to English (UK). Make a spelling mistake otherwise you can't get to spelling options. Click Tools > Spelling and Grammar - 'Spelling and Grammar check complete' i.e. it did not mark the work incorrect. Note: I've found that even after doing this (on Word for Windows at least), it still considers certain US spellings as acceptable alternates for UK ones and refuses to mark them as incorrect. Not the answer you're looking for? 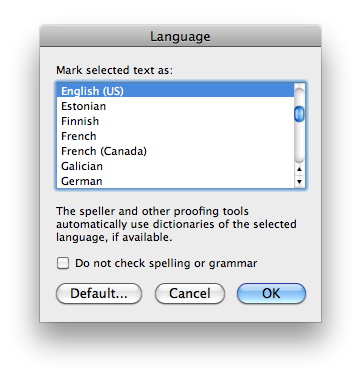 Browse other questions tagged macos microsoft-word osx-mountain-lion or ask your own question.